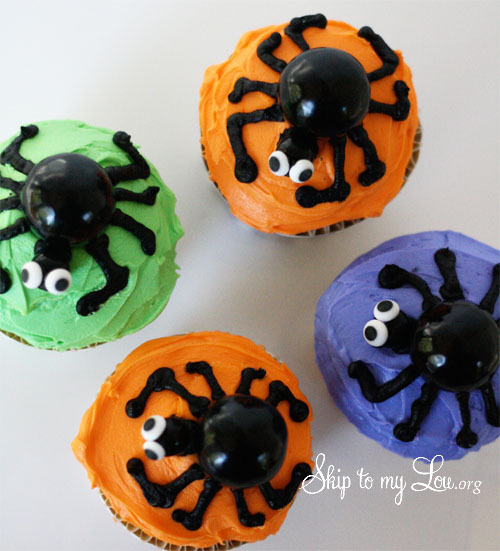 Here is an idea for fun, easy Spider cupcakes. 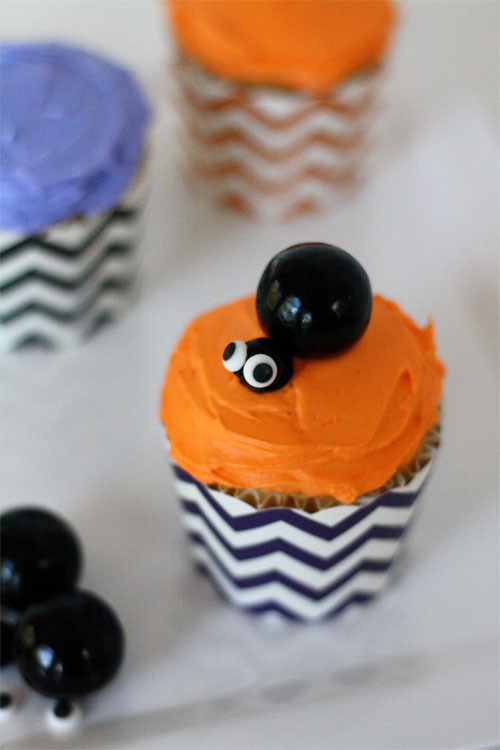 These gum ball spider cupcakes make great Halloween party food. Whip them together for your next Halloween party or for a fun Halloween activity for kids. You can get all the items pretty easy and kids can put them together without much adult help. To save time you can buy unfrosted cupcakes at the grocery store or bake them at home (they do taste better). 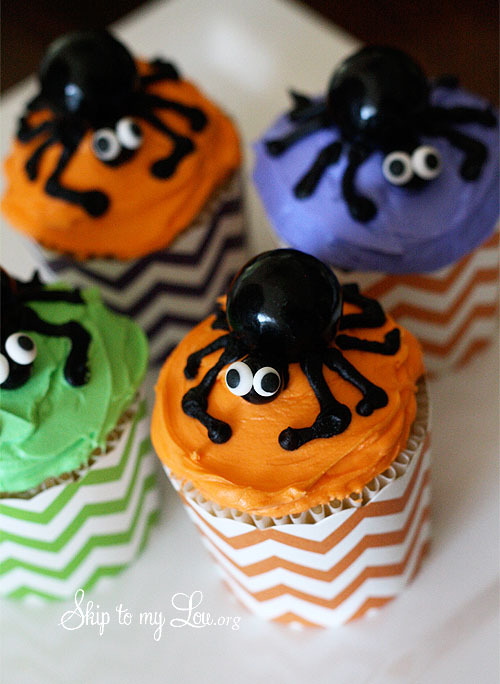 Let’s get started and make the cutest spider cupcakes around. They would be perfect ending to a spooky Halloween dinner! I used those darling chevron baking cups again, but this time I didn’t bake in them —I slipped my baked cupcakes in afterwards. Follow these picture to make easy Halloween cupcakes in 4 easy steps. 1. Place a gumball on top of the frosted cupcake. Add a small dot of frosting to hold on a sixlet. 2. Place sixlet on cupcake in front of the gumball. 3. Use frosting to attach two small candy eyes to the front of the sixlet. 4. With the black frosting draw on legs. 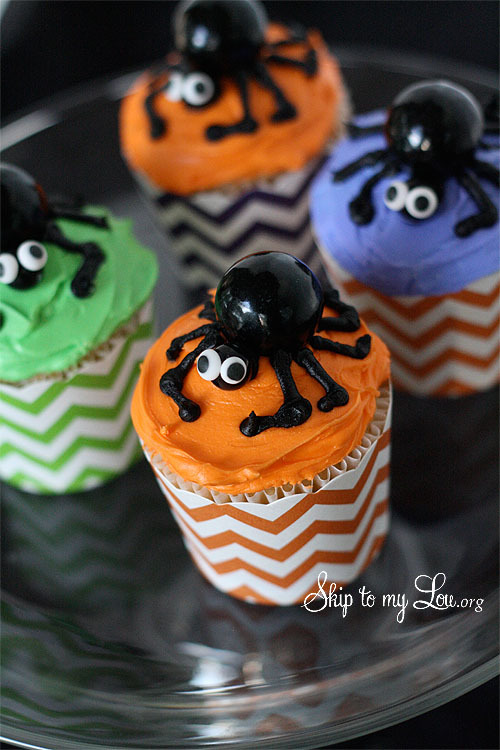 You will have some fun spider cupcakes. They just enough cute and creepy to wow all your friends this Halloween and best of all you made them! 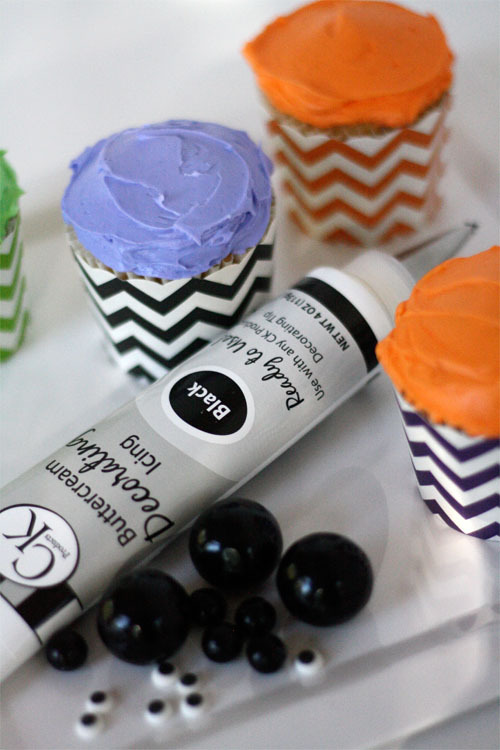 These are a fun Halloween treat for a party! I love all the bright colors with this amazing spider! Did you see my witch finger cupcakes? 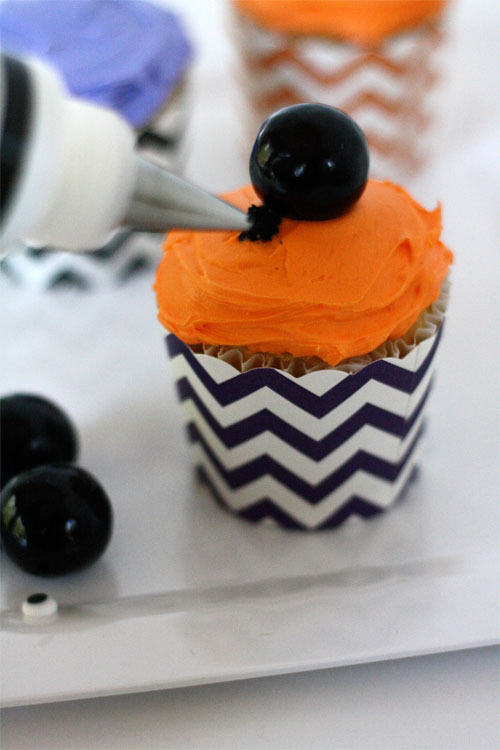 You might also be inspired by these 24 Halloween cupcakes! I love making cute cupcakes for holidays and special occasions and your kids will too! If you want more spider ideas check out these cute spider cookies. These Halloween coloring pages are a great way to keep small children happy while you are baking or have some downtime. Hey Cindy! I love these! In fact, I'm copying them for our church Halloween party tomorrow! One quick question. I ordered the chevron baking cups. I read here that you didn't bake in them but slide them in after. I'm afraid if I bake the cupcakes in liners in the muffin tin, they won't fit in the baking cup later. Did you do mini cupcakes? Is it ok to bake in them (will it distort the color of the cups or anything?)? I know they look small, but I baked the cupcakes in regular white liners in a standard (not Wilton, they seem large) muffin tin and then put them in. You can also bake directly in the cups. Fill the cups about half full. Thanks Kendra! Sixlets, are candy coated chocolate balls. Yum! These are adorable! I'd never heard of sixlets but I can't wait to try them! Thanks!! How did you make spiders look cute?! ;) Love this adorbale idea! I think the eyes give the spiders a touch of whimsey! Have been searching for ideas for a halloween party. 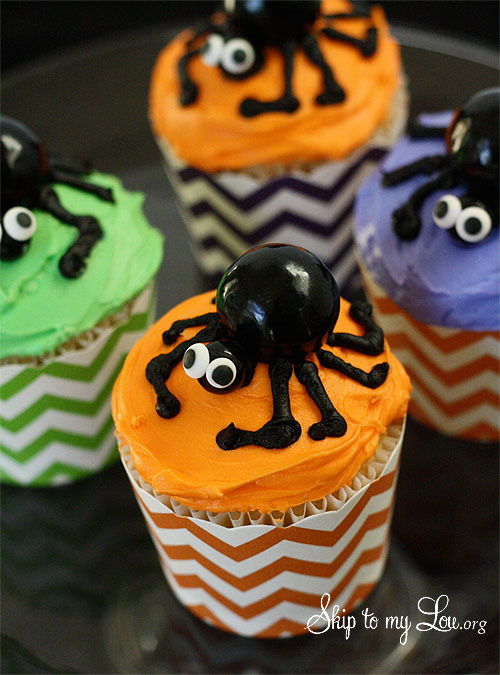 These spider cupcakes are just was I was looking for. Thanks for sharing!